Look around online, and you will undoubtedly come across many excel scheduling templates, formulas, and instructions on how to use them. What you may not realize is that scheduling with spreadsheets is not only ineffective, it’s also outdated. Scheduling can represent the lifeblood of many industries. So using old methods of doing it may not do your organization any favors. Here’s exactly why scheduling with spreadsheets is a technique of the past. While a spreadsheet can help for a small business, it’s not ideal at all if that business starts to see any growth. As your business and its needs grow, scheduling becomes far more complex. You can get by with a spreadsheet for a little while, but eventually those spreadsheets will become unwieldy. You will have spreadsheets choked with years of data and increasingly complex formulas that require an expert to maintain and update. This brings up the next point about them. It’s possible to spend all day maintaining spreadsheets. If you or an employee must spend large chunks of time scheduling, it defeats the purpose of scheduling with spreadsheets altogether. Having a tool to aid in scheduling should save you time, and increase overall efficiency. If that’s not happening, then you need to switch to a more robust and dedicated tool. You will certainly reach a point where your spreadsheets become so complicated that only an expert can iron out any kinks that show up. If you’re employing someone just to figure out the one mistake that threw off all of your numbers, then you’re working with an outdated tool; and the truth is, mistakes are going to happen. Errors abound in spreadsheets. Even if you’re meticulous, there’s a good chance an error will find its way in there somewhere. It’s a well-known fact most spreadsheets contain errors. The more rows in your spreadsheet, the higher the possibility of an error. The more keystrokes someone must enter, the better the chance of miskeying something. As you add more employees and contractors to your staff, you will demand more and more from your spreadsheets. The more you demand of it, the greater the likelihood of a user-error. A single error can cause someone to miss work, cause the business to have a short staff on the day it needs all hands on deck. It can cause you to miss opportunities and various other problems that can damage your business. While scheduling with spreadsheets can help you keep a little order, they’re not ideal for figuring out your scheduling needs. If you know how, or have an expert, you can probably get your spreadsheets to give you metrics, but that can become a time consuming and costly project. Dedicated scheduling systems can give you metrics, data, analytics, and reports on the fly. You can easily see where you need to focus your efforts, which days see the most absences, and where you can make changes to benefit the organization. 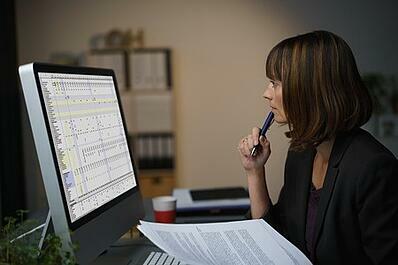 Spreadsheets can help in several ways, but they’re not great management tools. There’s many things that spreadsheets cannot do, or cannot do without a lot of effort. For these reasons and more, spreadsheets are inefficient and outdated when it comes to workforce management. A workforce management solution tailored to your specific industry makes far more sense.